An American soccer player Andrew Carleton currently plays for Atlanta United FC. Moreover, Carleton has featured on several United States youth national teams and plays the position as a Midfielder. He signed for Atlanta as an HGP (Homegrown Player Rule) on 9th June 2016. Carleton played 2016 season for Charleston Battery and became the youngest American professional player in history to start a USL match on 10th September 2016. He earns a base salary of $75,000 and an average annual salary of $87,400. 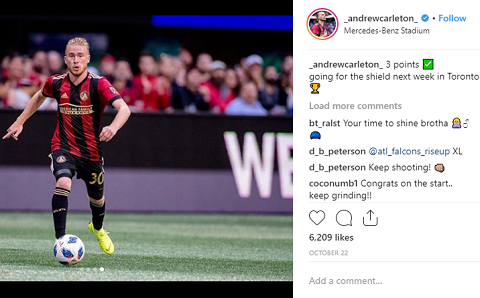 Andrew Carleton was born on 22nd June 2000, in Powder Springs, Georgia, United States. His parents are father John Carleton and mother Michelle Carleton. Carleton grew up along with his siblings, brothers Alan Carleton and Johnny Carleton and sisters Erin Carleton and Erica Carleton. His brother Alan plays for Atlanta United's youth team and Erin plays for Concorde Fire FC. Similarly, his sisters play for Southern Soccer Association. He belongs to an American nationality. However, he hasn't revealed any information about his education background. Andrew Carleton signed for Atlanta United FC as an HGP (Homegrown Player Rule) on 9th June 2016. However, he played the 2016 season for Charleston Battery on loan. On 10th September 2016, Carleton became the youngest player in the history to play start a USL match. Carleton made his debut for Atlanta United on 11th February 2017, in a match against Chattanooga FC. Similarly, he made his MLS debut on May 20, 2017, in a game with Houston Dynamo. Carleton currently plays for Atlanta United 2 on loan. He scored his first professional goal on April 21, 2018, in a match against Louisville City FC. Andrew Carleton is not married yet. Moreover, he is not dating anyone currently. To date, there are no any records of Carleton's past relationships. Similarly, he hasn't faced any rumors regarding his love affairs. Carleton is also active in social media including Instagram and Twitter but so far, he hasn't shared photos of girls which gives signs of his relationship. As he is not married yet and is dating anyone, his sexual orientation is straight. Carleton might be focusing on his career rather than being involved in any kind of personal stuff. Andrew Carleton, aged 18, the handsome hunk stands the perfect height of 1.70 m which is 5 feet 7 inches tall 66 kgi.e. 150 lbs. Andrew Carleton earns a tremendous amount of money from his professional career as a soccer player. As of 2018, the estimated net worth of Carleton is still under review. Currently, he plays for Atlanta United 2 and earns a base salary of $75,000 and an average annual salary of $87,400. Moreover, Carleton previously played for Atlanta United and Charleston Battery. He is playing soccer since his school days. Analyzing his hard work and dedication, Carleton's net worth is sure to be in six digits. Likewise, his current market value is £405k.